Indie trio combines personal lyrics with carefully-crafted instrumentals. Inspiration comes in weird places, like the windowless, Tenderloin practice pad where members of San Francisco indie band Geographer run through their current set list. Their songs are idiosyncratic and textured, often beginning with a single keyboard melody and building to a full orchestra. "Kites" begins that way. A simple tune acts like a scaffold for Mike Deni's ethereal vocals. Then the beat kicks in bass-heavy and percussive, like something out of early-Nineties hip-hop, and the other instruments rush in: electric cello, drums, samplers, synthesizers. Sounds fill the room, seep through crannies, and drift, dream-like, down to the sidewalk below. That may seem like an insular process. But there's no question that Deni and fellow musicians Nathan Blaz and Brian Ostreicher have found a composition style that works. Combining synthesized beats, orchestral asides, and haunting vocals, they've garnered comparisons to Radiohead and The Postal Service. 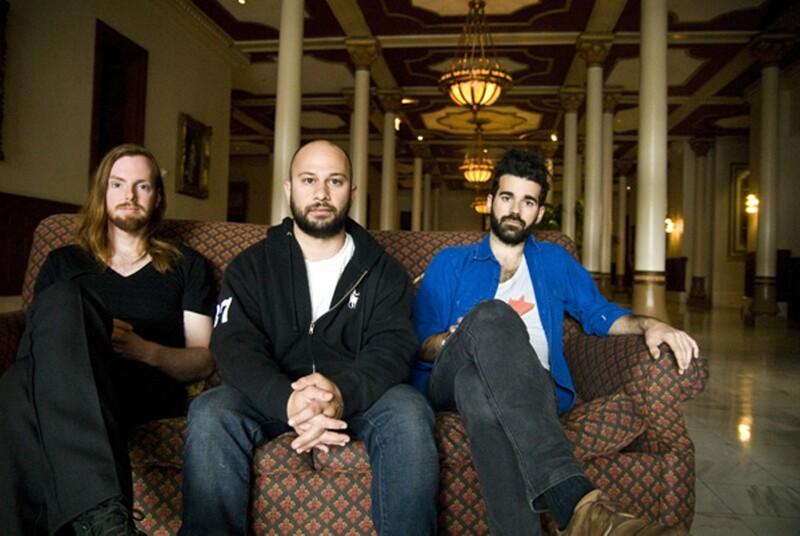 Geographer's EP Animal Shapes came out on Tricycle Records in March and was re-released in August. It's a decidedly dancey follow up to Innocent Ghosts, the band's folky 2008 debut. The self-released record earned the band a nod from Spin.com, which named Geographer one of "Three Undiscovered Bands You Need to See Now." You might chalk it up to a solid musical pedigree. All three members picked up instruments at an early age. They played in bands in high school, and Deni wrote songs as far back as middle school. Drummer Ostreicher and celloist Blaz met as students at Berklee College of Music. They collaborated on projects before Geographer, and they have current side projects, as well. Ostreicher has a solo project called 0mnis0und, and Blaz plays cello in Honeycomb with Kacey Johansing. She used to be part of Geographer, too, and once she left, the other three musicians moved in a more electronic direction. It seems promising. At a recent show before an absinthe-sipping audience at The Academy of Sciences, Geographer got the museum-going crowd to move. The stage was outside against a glass wall, and people wandered through a Galapagos exhibit behind them. They opened with synth-heavy "Verona" from Animal Shapes and followed with "Can't You Wait," the first track from Innocent Ghosts. Their live performance is all about focus and precision. They talked to the audience very little during the seven-song set, and when his voice hit higher registers, Deni sang with his eyes closed. Blaz tucked his long hair behind one ear, and his bow bounced quickly across the cello's strings. The crowd continued to grow as they played, and between songs, a woman shouted "Aquarium!" like someone might yell "Free Bird." Geographer makes indie pop that's personal and steeped in emotion. That comes across even when the lyrics are difficult to make out. The band members say they craft their songs in the studio without regard for how they'll perform them live. "After the recording is done, we'll get together and practice and say, 'Okay, who's got enough arms or feet for this?'" Deni said. This can mean they'll have to mimic an in-studio edit, and sometimes they find a solution they like better than the recorded version. They get excited just talking about the process, and the results obviously translate well onstage. At Academy of Sciences, they managed to be crowd-pleasers without actually engaging the audience. It shouldn't have surprised anyone at that show that we were actually witnessing a catharsis, of sorts. Innocent Ghosts was borne out of a lot of personal pain. When Deni's father and sister passed away unexpectedly, he dealt with it by making music. He does most of Geographer's songwriting. "I need to express myself in that way, and it's awesome that people like to listen to it," he said. "It's just the greatest coincidence — I would be doing this stuff no matter what." When he's not writing, he works as a special education preschool teacher's assistant. The band has enjoyed a good year. Geographer opened for Atlas Sound at the Great American Music Hall in February and played Live 105's BFD in June. Online sales picked up in March when the band was featured by iTunes, and Animal Shapes was listed as a top ten pick by iTunes' staff. They toured the East Coast this summer and drew a big crowd in NYC at a show with label-mates Pianos. In September, "Kites" aired on the premiere of MTV reality show The Buried Life. With all that momentum, Geographer is hard at work on its next album. After three years of making music together, the band members say they gained a better understanding of both production and performance. You'd know that just by looking at their stage setup. Deni sings and alternates between a guitar, bass, synthesizers, a laptop, and two tiers of keyboards. Blaz plays the electric cello with laptop in easy reach, and Ostreicher covers drums and backup vocals. All together, it makes for an impressive tangle of cords. "Nowadays we try to play gigs with sound guys," said Ostreicher. As their next album takes shape, the songwriting process is starting to shift. Deni still writes songs, but some are coming together as they jam. When it comes to the synth side of their sound, they are striving for a polished feel with a few rough edges because some of their favorite music is better because of its imperfections. "Especially with electronics, it's really easy to dial things in perfectly," Blaz said. "It loses some personality." Deni added, "We're making a very conscious effort to run things through the mud and the dirt a little bit more." At practice, Deni can't help but dance a little, just like he did during the Academy of Sciences show. Their music is easy to get lost by design, he said. "I mean that's what you go for in every experience: to have everything else melt away."